Nigel Smeeton is based at the Centre for Research in Public Health and Community Care, University of Hertfordshire. For many years, he taught statistics to dental and medical students at King's College London. His research has focused on stroke, asthma, psychiatry, and adolescent health and behaviour. 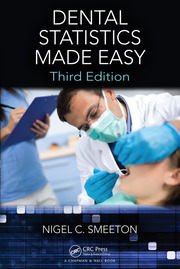 The third edition of his introductory text Dental Statistics Made Easy (CRC Press) has recently been published. He is co-author of Applied Nonparametric Statistical Methods (CRC Press). Nigel Smeeton started his career as Statistical Assistant at Leeds University in the Department of Statistics, supporting the research activities of the Professor of Statistics, teaching statistics to undergraduate and postgraduate students, and running the statistical advisory service as a resource for academic staffs at Leeds. In 1983, he joined the General Practice Research Unit at the Institute of Psychiatry, London. His research included the modelling of episodes of mental illness, the classification of mental illness, and the investigation of the repetition of attempted suicide. Moving to the United Medical and Dental Schools (now incorporated into King's College London) in 1990 enabled him to develop his teaching and tutoring skills. He established and organised the undergraduate (BDS) course in dental statistics and wrote the text Dental Statistics Made Easy. He also organised the undergraduate (MBBS) course in medical statistics, and contributed to postgraduate courses in general practice and public health. During this period he co-authored two editions of Applied Nonparametric Statistical Methods (CRC Press) with Peter Sprent. In 2011, he took early retirement from full time employment at King's College to focus on family events and produce the second edition of Dental Statistics Made Easy. He joined CRIPACC as Social Statistician in 2013. He is currently involved with the WHO Health Behaviour in School-Aged Children project and in the development of the epilepsy risk awareness checklist (ERAC). Capture-recapture methods in the estimation of population size; multinomial logistic regression in modelling asthma symptoms; proportional hazards regression applied to survival following a stroke; kappa statistics in assessing observer agreement. He has an ongoing interest in the influence of ethnicity in medical/ social research and was principal investigator for a comparative study of stroke in Barbados and South London.